In its 50 plus years Stand Magazine has published early work by many writers who have gone on to become established figures - Ken Smith, Tony Harrison, Michael Hamburger, Douglas Dunn, Jeffrey Wainwright and George MacBeth are just a few. The magazine has also played a major role in bringing the work of Russian and East European writers in translation to an English-speaking audience. 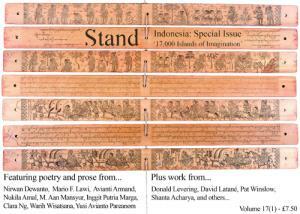 The complete archive of the new series of Stand Magazine is available here. It contains 59 issues shown according to the year of publication, which can be selected from the drop down list. Clicking on a cover image will take you to the table of contents for the chosen issue. The current Archive gives access to the tables of contents for all of the issues of Stand Magazine published since March 1999. At this point the Volumes were renumbered to start again from Volume 1 Number 1, 1999, to date. We are working on listing in this format all of the issues in the previous published sequence from Stand Magazine Number 1, 1952 to Volume 40 Number 2, Spring 1999. Until this is complete, you can access a list of all of the authors and their works published from 1952 as a downloadable spreadsheet.